Looking for a special and unique wedding experience? Well, you’re in the right place. Whether you’re interested in large wedding cakes, cupcake displays with a wedding cake, dessert tables, individual wedding favors, dessert additions to candy displays, grooms cakes or even edible seating cards, we’ll help you choose a perfect wedding dessert! Start with our massive collection of flavors and styles to create a display that you and your guests will be talking about for years to come! Then share your colors and theme so we can help you design an unforgettable dessert table display. Already know what you want? Start Your Order Process Now or stop by one of our stores to discuss your special day. If you’re just beginning and searching for ideas, read on to see what’s possible with our Cakes, Cupcakes, Cake Pops, Cookies, and More. 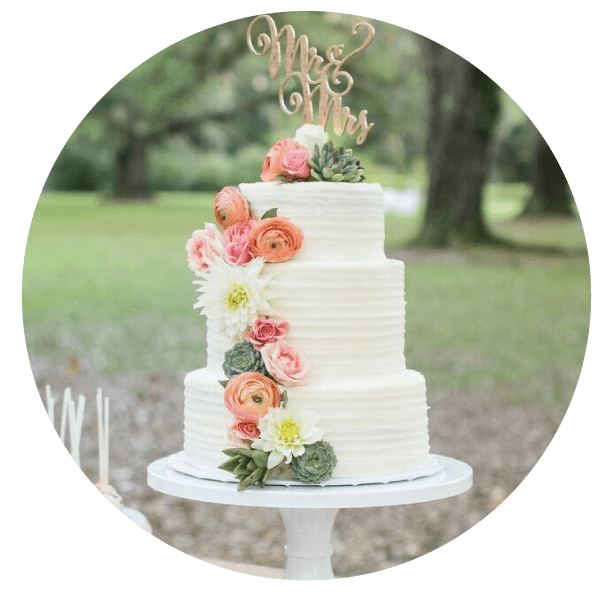 From small cakes to cut with your bride or groom to large cakes that will serve all of your special guest, you’ll find what you’re looking for at 3 Sweet Girls Cakery. Over the years it has been our pleasure to work with tons of couples and create come of the coolest designs. Click Here to check out our Wedding Cake Gallery. In order to help you realize your dream dessert display, we’ll nee to meet with you. That is where we’ll be able to discuss possibilities and quote pricing. As you can imagine, there are far too many details involved in any wedding order to have a simple price chart. We’ll need to understand your vision, so we can figure out how best to help you realize it. Contact Us Today to schedule a consultation & tasting! Cupcakes are one of the yummiest and most versatile options for your dessert table. Why lock yourself into just one flavor of cake when you could have multiple towers filled with enough flavors to please everyone? This is just one of the reasons why cupcakes are becoming more and more popular at wedding celebrations. A variety of flavors and styles is not only visually appealing, but practical as well. You can display them on a tower, on platters, or individually wrap them as wedding favors for your friends. You can refer to our Cupcake page for general information on cupcake flavors and pricing. 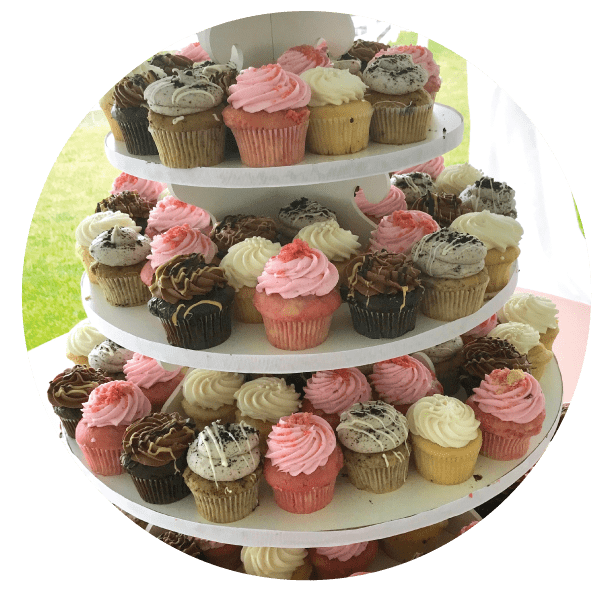 However, please understand that pricing for Wedding Cupcakes is often different than standard orders, because of display options, delivery, set-up, and other details. Click Here to check out our Wedding Dessert Display Gallery. OK, we’ve talked Cake and Cupcakes, now it’s time for some real fun – Cake Pops! These little treats make fantastic centerpieces, bucket and tower displays, and even tiered cakes. They come in a tons of flavors and styles and they work great for favors as well. The possibilities are endless with cake pops and we’ve done some super cool things with them. 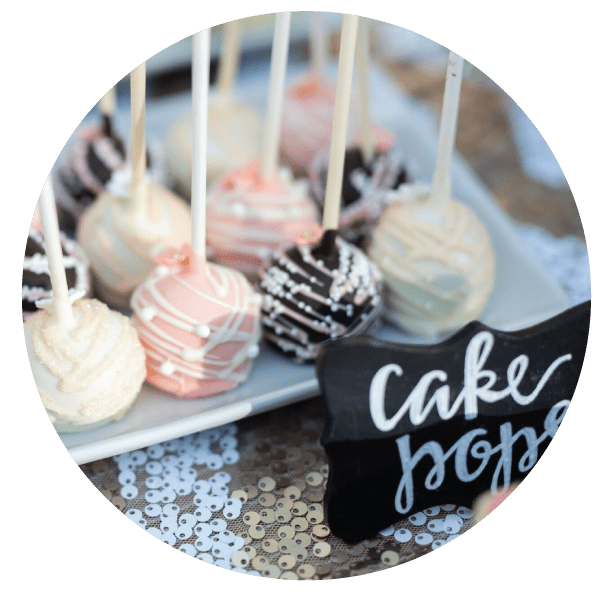 So, if you’re looking for something different to add that extra pizzazz to your dessert display, try some Cake Pops. Want to see some photos for idea material? Click Here to check out our Wedding Dessert Display Gallery. The tradition of the groom’s cake can be traced back to the Victorian era in England, when, in addition to the main wedding cake, there was also a groom’s cake. 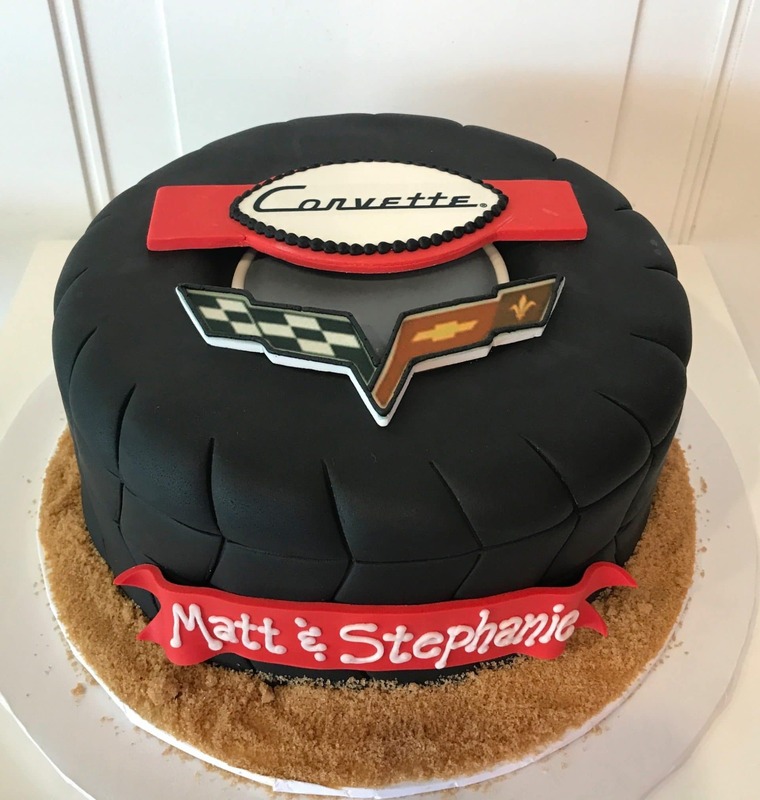 Many brides find the groom’s cake appealing because it’s a way to give the groom special recognition on a day when most of the attention seems to center on the bride. Tying cards to cake pops makes a clever seating chart your guests won’t forget! How about monogramed cookies, chocolate-dipped pretzels, brownies, or cupcake in a jar to commemorate the occasion? Need more inspiration? Tell us your idea and we’ll help you create something truly extraordinary! Tastings are hosted by appointment during normal business hours at our Kenwood location. Your tasting is where you can sample a variety of items in several flavors. Bring in photos of things you like and allow at least an hour for the full experience. We will also have samples of cake pops and cookies available. View our profile at The Knot – website dedicated to all aspects of wedding planning. You may like to check our FAQ page for more information and please contact us or call 513-984-1100. Because we maintain a large variety of flavors and our menu is always changing, please see our Menu section for the latest selection. Do you rent towers and wedding cake stands? We rent cupcake towers that are shown in many of the displays on our website. We do not require that they be used but we do know that our stands are quality and going to hold the weight of your orders and present beautifully. If you choose to purchase your own or make one we would like to know details ahead so that we can know that it is going to work. In addition to towers, we have many other display pieces available for rent. We also have wedding cake stands available to rent. Can you do custom wedding cakes? Yes, we make custom cakes for weddings and other occasions. When can we set up a tasting/consultation? Tastings are by appointment during normal business hours. 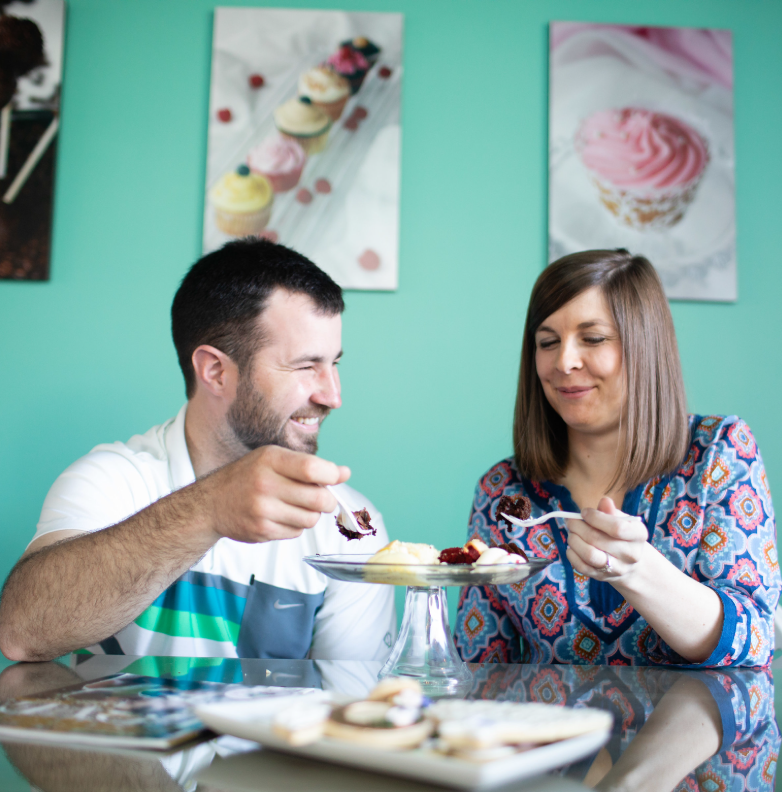 We use that opportunity to get to know you and learn more about what kind of wedding desserts you would like. A wedding tasting is usually 30-45 minutes depending on how many questions you have. Our wedding consultation let you sample different flavors of cupcakes or cake pops that we have on our in-store menu that day. All of our cakes are made out of the same flavors as the cupcakes and cake pops. This allows you to get an idea of the quality and variety of our products. Our consultation/tasting fee is $30. You may have a total of 4 people including yourself at the tasting. If you decide to book your wedding with us we take a $75 deposit to save the date for you. Once a deposit has been placed to hold your wedding date we can work together on specific flavors for your wedding. We have a specific color that we are trying to match. Can we request colors? We can match many different colors. If you have something very specific in mind, bring us a sample of the color so that everyone agrees on the specific shade. We’ll consult with our bakers to ensure that we can match it to your satisfaction. Can you set up for the event? Yes, we have worked weddings at most of the major event locations throughout northern Cincinnati and Northern Kentucky. We’ll be happy to work with your venue to ensure that your display is set up properly. Delivery and setup prices are based upon the details of the display and the location of the venue. What do we need to do to book our wedding date? To book your wedding date, you’ll need to Contact Us to get on our production and delivery calendar. Then you’ll want to schedule your Tasting. Finally, you’ll need to pay a non-refundable $75 deposit at least 2 weeks prior to the wedding. This is also when we need your final count. If your event cancels, your deposit is forfeited. If cancellation occurs less than 2 weeks prior to the event, you are responsible for all remaining charges. This policy is in place to both protect all parties involved. We only take a certain number of weddings each weekend so that we can provide the most specialized service! We know that you want the best for your wedding and so do we.